LG today said that its OLED televisions as well as Optimus G Pro, the flagship smartphone of the South Korean manufacturer, will soon arrive in the Indian market. This announcement was made at the LG Tech Show 2013, where the manufacturer showcased its whole product range under one roof, including forthcoming products across all segments. 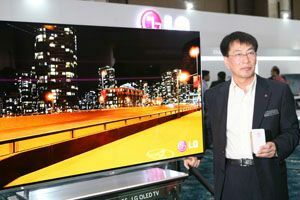 LG said that OLED TVs - widely considered to be the next step in the evolution of televisions -- will hit retail stores in India in second half of 2013. OLED TVs are thinner, lighter and brighter than LED TVS; have wider viewing angles and consume much less power. LG didn't reveal the India pricing of these TVs, which cost as high as $12,000 in the US. At Consumer Electronics Show 2013 in January, LG unveiled the world's biggest OLED TV, with screen measuring 55-inch diagonally. This TV measures 4mm along the waistline and weights 22 pounds. The manufacturer also showcased an OLED TV with curved screen at CES. The company also said that it will continue selling its range of Plasma TVs, featuring the oldest technology among modern ​televisions, in the country. The company's India managing director Soon H Kwon said that Optimus G Pro will arrive in the country in June or July at approximately Rs 40,000. The phone comes with a 5.5-inch screen in the Korean market, whereas a 5-inch variant is sold in Japan. Other specifications of the device include a 1.7GHz quad-core processor, coupled with 2GB RAM, and 32GB in-built memory, along with microSD card support. LG has included an 13MP camera with LED flash on the back, while the front panel has a camera with 2.1MP resolution. In the past month, LG has rolled out its latest smartphones - Optimus L7 II Dual and L3 II Dual - in the country soon after their global launch. Another device announced in 2013, LG Optimus L5 II Dual is now available on e-commerce websites in India. In February, the company launched Optimus G - its erstwhile flagship and a rival to Samsung Galaxy S III - at Rs 30,900, making it the priciest phone in its portfolio. The manufacturer also plans to soon introduce convergence products like refrigerators with TV screens and washing machines with self-diagnosing mechanisms in the country. Also in the offing are products like water purifiers with not only hot, cold and room temperature dispensers, but also ultra filtration (UF) attachment for washing vegetables and fruits. Kwon declined to talk about the India launch of Google Nexus 4, which is manufactured by LG. The company said it is still working with Google over which of the two will roll out the device in the country. In India, Google sells the basic variant of Nexus 7 tablet (manufacturer by Asus) via its online store; the device with higher specifications is retailed by Asus from its stores. Currently, there are approximately 600 LG showrooms across India.